THE GOVERNMENT HAS today approved legislation that will allow for the establishment of medically supervised injecting centres in Ireland. The legislation is expected to be brought before the Dáil over the next few weeks and the first pilot centre should open in Dublin’s city centre this autumn. 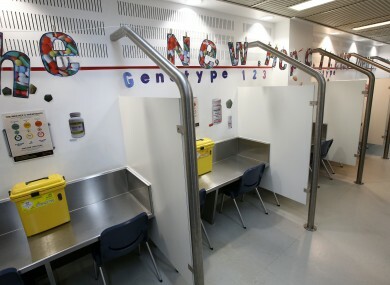 There has been some opposition to the centres, which aim to provide a safe space for drug users to help ensure they use clean needles – and dispose of them properly – and have interaction with medical practitioners and other service providers. Users will be able to self-administer drugs they have brought with them to these facilities. As well as allowing the minister to issue licences for the operation of these centres, the bill will provide an exemption for drug users from the offence of possession when in the facility. However the Department of Health stressed that possession of controlled drugs will continue to be an offence outside a supervised injecting facility. Possession for sale or supply will remain an offence both inside and outside a supervised injecting facility. Drugs minister Catherine Byrne said the new centres will be a ‘safe harbour’ for chronic drug users. “They will provide a controlled place for people to inject, but will be much more than that – a place to rest, have a chat and access the services people need,” she said. I believe in a health-led and person-centred approach to the drug problem. For me this is all about people and looking after the most vulnerable and marginalised in our society. The human cost of public injecting is clear and keeps adding up – the lack of dignity, the effect it has on people’s health, wellbeing and safety. We know that these facilities are not the sole solution to the drugs problem and many other steps are needed, but I am committed to doing everything we can to help those who need it most. The Temple Bar Company which represents businesses and cultural centres, have voiced their concern saying that it would effectively decriminalise drugs in certain areas of the city. “We have a serious drug problem in Dublin city with more than 20,000 heroin addicts. Public injecting is a problem as is [public] defecation and urination – which is linked with drug addiction. The Temple Bar Company collect 1,500 used syringes from our streets every year. In light of today’s decision at cabinet, we are bracing ourselves for an increase in the level of syringe disposals and related anti-social behaviour. “I understand it’s counter intuitive to some people, but the evidence is very clear these services improve the amenity of the area they are established in; they save lives, they keep people healthier; they move people through to treatment and rehabilitation faster; and they save taxpayers money. The bill does not establish locations for the injection centres, but the HSE has established a working group to gather data and identify possible options. “I know people have concerns about where this first pilot facility will be located, but I want to assure you that no decisions have been made,” Simon Harris said today. Email “'A place to rest, a place to chat - a safe harbour': Injecting centres get Cabinet approval”. Feedback on “'A place to rest, a place to chat - a safe harbour': Injecting centres get Cabinet approval”.